On Wednesday, I had the opportunity to meet with our state's two senators, Patty Murray and Maria Cantwell, through a Lead America summer program at Georgetown. I took the opportunity to talk to both senators about healthcare reform and solving the crisis for NPI. As many readers know, prospects for getting strong bills out of either house aren't looking good at this point. The bill approved by the Senate's HELP (Health, Education, Labor, & Pensions) Committee, which Patty Murray sits on, includes a public option, which is the foundation of any real reform. I thanked Senator Murray in person for repeatedly and publicly voicing her support of the public option, and asked what she thought about the future of the bill. For Senator Murray, the principal work is over because she does not sit on the Finance Committee. That Committee, one of the Senate's largest, is chaired by Montana's Max Baucus, who is uncommitted to a public option. When asked whether the whole Senate will be voting on legislation built around a public option, Senator Murray responded, "I just don't know". She acknowledged that the Finance Committee is currently in the driver's seat on the matter. Later on, I met with Washington State's other Senator, Maria Cantwell, who is a member of the Finance Committee. I asked Senator Cantwell if she thinks a public option will make it to the floor. She hedged and said it might not happen. Senator Cantwell told me that the bill will probably not be what I want. Note the pronoun choice: she used "I" instead of "we", even though she herself has claimed to be in support of a public option, which is how I phrased the question. Why can't the Finance Committee go ahead and approve a bill with a public option? Well, first, because Chairman Baucus isn't sure his constituents are in favor of a public option (sorry, did I say constituents? I meant lobbyists) and, second, because Baucus wants the bill to have bipartisan support; as Senator Cantwell explained, three Republican votes are needed on the floor to pass a bill. (See, letting a few Republicans dictate details - so we can bargain for their votes - is apparently more important than actually sticking to the principles the President has already promised that healthcare reform will be designed around). My thought was, why do we need three Republican votes, Senator? Didn't the Republicans routinely pass bills with fifty one votes when they ran the Senate? She revealed that Republicans are filibustering pretty much everything; there have been ninety filibusters so far in this Congress. Worse, she believes reconciliation is not an option for a major issue like healthcare reform. She further stated that if we could get enough Senators to ignore the traditions of the Senate, we would be able to pass bills with fifty one votes. Of course, this is not Senator Cantwell's fault. Harry Reid leads the caucus. And he's letting conservative Democrats and Republicans control the Senate. In other words, because Harry Reid is such an ineffective Majority Leader, sixty is the new fifty one. On paper, we have those sixty votes, but in reality, we don't, because Senators Kennedy and Byrd are ill and frequently not available. So even though we've got all these new freshman Democratic senators - a far cry from where we were in the last Congress, when Democrats barely controlled the chamber - we're still at the mercy of Republicans. Come again? Max Baucus' stance that we have to find Republican votes for healthcare reform is thus blessed by the Majority Leader. But a growing number of Democratic senators seem to think he's just not doing a good job. There are rumblings that perhaps it's time to replace Baucus as chairman. And if those answers were not discouraging enough, the Senate is dawdling with the Waxman/Markey bill. That legislation, H.R. 2454, which aims to curb emissions through the establishment of a "cap and trade" system, has only a forty to fifty percent chance of passing the Senate, according to Senator Cantwell, who believes a price needs to be put on carbon. A big part of the President's progressive agenda looks imperiled at this point. Party because of weak Democratic leadership in the United States Senate. Now is the time to call your Senators. The lines are, to use an old cliche, ringing off the hook. According to the folks who answer phone calls for our Senators, healthcare is a top issue of concern. Surprise, surprise. Anecdotally, in the combined thirty minutes I was waiting to see the Senators I must have heard at least twenty calls about healthcare reform. Calls are coming in roughly even supporting the public option and going against it, staff say. All we can do is continue applying pressure. Senators will soon be back at home and meeting with constituents about these issues during the August recess. They need to see nothing short of a tremendous progressive grassroots uprising to demonstrate that people are sick and tired of politics getting in the way of desperately need solutions in our nation's capital. The Pacific Northwest is finally starting to cool off a little bit, after Seattle and Vancouver, B.C. each snapped all time temperature records earlier this week. Last night brought relief for those sleeping in homes without air conditioning, as outside temperatures fell into the mid sixties. Highs in the mid eighties are expected over the next few days, with lows dipping into the fifties. Mostly sunny/partly weather comprises the forecast. The record heat has the nation talking. An Associated Press wire story about the record-breaker ran in newspapers and on television station websites coast to coast. Brian Williams mentioned it on his NBC Nightly News broadcast on Wednesday. [T]he weather pattern over North America has two big features -- a big, big ridge of high pressure anchored along the western third (stretching from Baja to almost the Arctic Circle) and a big, big area of low pressure anchored over Hudson Bay. Not only has that ridge baked the West Coast, but on the other end of the scale, that low has made life miserable for the rest of the nation east of Denver. There, summer has gone into hiding, with relentless rain and thunderstorms. New York City is on pace for one of their coldest July's ever. With such exaggerated patterns, it's hard for them to budge because they are so strong they get stubborn. Incoming weather systems, typically weaker around here in summer anyway, are no match to move a ridge of this size, and then in turn, this ridge doesn't move to push the eastern low out of the way. It's like having a disabled semi jackknifed on the 520 bridge -- there's just not much room to move. To conclude, the weather won't be changing much anytime soon, although now that we've moved more to a comfortable plateau of about eighty five degrees Fahrenheit for our high, it'll seem like a real Pacific Northwest summer again. Mr. Dobbs' first began reporting on Obama birth certificate conspiracy theories on the night of Wednesday, July 15. In the roughly two weeks since then, from July 15 through July 28, Mr. Dobbs' 7 p.m. show on CNN has averaged 653,000 total viewers and 157,000 in the 25-54 demo. By contrast, during the first two weeks of the month (July 1 to July 14) Mr. Dobbs averaged 771,000 total viewers and 218,000 in the 25-54 demo. In other words, Mr. Dobbs' audience has decreased 15 percent in total viewers and 27 percent in the demo since the start of the controversy. Dobbs' rating slide suggests that the birther sideshow is considered by a not insignificant portion of his audience to be a turnoff. It also suggests that Dobbs' program has lost some of its appeal. Both conclusions are refreshing. Since it isn't bolstering ratings, the birther sideshow will pretty much have to shut down, and the media will have to move on to something else. It's been illuminating to see how strangely Republican congresscritters on the Hill behave when confronted with this lunacy (kudos to Mike Stark for that), but otherwise, the whole sideshow has been a waste of time and energy. Secretary of State Sam Reed's office announced this morning that it has tallied submitted 137,689 signatures for Referendum 71, a right wing effort to force a public vote on Washington's newly expanded domestic partnerships law. The official count is three hundred and eleven signatures less than what the referendum's backers estimated they collected. 120,577 valid signatures are required to qualify a referendum for the ballot. Typically, about eighteen percent of signatures are invalidated during the verification process. The fearmongers behind Referendum 71 cannot afford for even thirteen percent of their signatures to be invalid. If they achieve the low invalid rate that Sam Reed's office claimed that Tim Eyman's Initiative 1033 had (twelve percent) they will squeak on through to the ballot. But they are in danger of not making it. The Secretary of State is not bothering with a random sample check (probably a good thing) so that means the Elections Division is going to have to check all the signatures on the petitions. Or at least they'll be checking until the number of invalid signatures reaches 17,113. If there are that many, Referendum 71 won't go on the November ballot and the expanded domestic partnerships law will take effect, as it already should have. On another note, the fearmongers behind the referendum drive have obtained a restraining order in U.S. District Court preventing the release of the names and addresses of the people who signed the petitions to individuals who want to create a public, Internet-searchable database of the names. This is unfortunate. While we are strong believers in privacy, transparency in government is critical to the well being of democracy. The voter rolls are not a secret, and nor should the names of the people who signed these petitions be. The people who signed these petitions are forcing the rest of us to vote on this matter. We are entitled to know who they are. Firedoglake's Mike Stark continues to have no luck trying to get Cathy McMorris Rodgers (R-Embarrassment to Washington State) to definitively state whether she believes President Barack Obama was born in the United States or not. In the second of a expose series entitled "Birthers on the Hill", Stark locates and attempts to pin down McMorris Rodgers on the matter, telling her he didn't know she was part of the Republican leadership and offering her the chance to clarify her answer from the first video, in which she says she'd like to see documents. She is is shielded by somebody who appears from the video to be one of her staff members. The aide tries to interrupt Stark's questioning by asking for a business card, and his name, while the Representative herself says nothing. Watch the video. McMorris Rodgers appears at the 0:55 mark. In this installment, we find the Republicans split into two camps. Mike Pence leads the sane brigade (he's joined by McClintock, and of all people, Peter King! ), boldly going where no elected Republican had gone before and agreeing with your humble correspondent's observation that the Birthers are a bunch of looney-tune extremists that do not deserve the respect of the Grand Old Party, or, for that matter, anyone else. The footage is alternatively compelling, funny, and distressing. How many in the Republican caucus refuses to disavow the conspiracy theory that Barack Obama was not born in the United States? The obvious answer: Too many. Break out the fans, popsicles, portable air conditioners, ice cream, and sprinklers: If today goes as forecast, Seattle is looking at setting an all time heat record. Let me repeat that again: We are on the verge of setting a new all time heat record. That's how hot it is around here. It is really, really, really hot. HOT AND HUMID CONDITIONS ARE EXPECTED TO CONTINUE THROUGH THURSDAY. HIGH TEMPERATURES FROM THE UPPER 80S TO 105 WILL BE ACCOMPANIED BY RATHER HUMID CONDITIONS AND ONLY LIGHT BREEZES. TEMPERATURES AT NIGHT WILL REMAIN QUITE WARM...FALLING ONLY INTO THE 60S FOR A COUPLE HOURS LATE AT NIGHT IN MOST PLACES. RECORD HIGH TEMPERATURES WILL BE WIDESPREAD...AND SEATAC AIRPORT WILL LIKELY TIE OR BREAK ITS ALL TIME RECORD HIGH TEMPERATURE OF 100 DEGREES. WHILE TODAY IS EXPECTED TO BE THE HOTTEST DAY OVERALL...THURSDAY WILL BE ONLY A DEGREE OR TWO COOLER IN MOST LOCATIONS. Redmond is expected to hit a high of one hundred and four degrees Fahrenheit today. No doubt Idylwood Park on Lake Sammamish will be packed. In fact, it's so hot out that Puget Sound probably will feel pretty good to any would-be swimmers. Normally, the Sound is unsuitable for swimming because the water temperature is so cold. That's not the case today. Those hitting the beach are urged to pack sunglasses, not spend too much time in the direct sunlight, and bring a nice big hat. Sunscreen's not a bad idea either, but most sunscreens are loaded with toxic chemicals, including leading brands Coppertone, Banana Boat, and Neutrogena. Stay away from those. Remember the days when conservatives used to smugly tell the rest of the country that it was unpatriotic not to trust the president, because, well, he was our president? Yes, indeed, those were the days. I want to go back to January 20th. Why are you people ignoring his birth certificate? He is not an American citizen...He is a citizen of Kenya... I don’t want this flag to change. I want my country back! That's from an unidentified woman at Delaware Republican Representative Mike Castle's recent town hall, who was loudly applauded and cheered by a bunch of old right wingers. Castle looked somewhat bemused, and was forced to say, "If you’re referring to the president, he is a citizen of the United States." Which, of course, drew boos. But it doesn't stop there. Here's a post from FreeRepublic (which I won't link to; those who want to read the silly comment thread can search for it). The “birth certificate" issue is tangential. If it were produced I, personally, would "trust but verify”. My point is, however, that the certificate itself is irrelevant. Barry Soetoro is the son of a British subject. He lacks "singular allegiance" to the United States of America. The only citizens excused from this requirement were those living at the time of the signing of Constitution. Accepting Mr. Obama as POTUS opens the door for any foreign despot (Putin, Ahmadinejad, Kim Jong-il, etc.) to father a child in America and purchase (usurp) the leadership of the United States for that child in due time. The Founders took precautions against that possibility, and we would be wise to enforce them. Ordinarily, this bile would sort of simmer in the various corners of the Republican Noise Machine, but it's now not only being served up by Rush Limbaugh, but by the likes of CNN's Lou Dobbs as well. Check out this video: several Republican Congressman tell me they don't believe Barack Obama is an American. Several dodge the question. Others offer weak-tea justifications for kinda-sorta believing Obama is a natural born citizen, Constitutionally fit to hold the office of President of the United States of America. Only one, Trent Franks of Arizona, gives a correct and clear answer, but even he can't help himself from suggesting that Obama is facilitating Jihad and turning America into a socialist state. Appearing in the video are our very own Republicans Cathy McMorris Rodgers and Dave Reichert, who, back in January, said he was "on board" with President Obama's agenda. McMorris Rodgers, trying to evade the camera, would only say, "We’re all going to find out..." and "Oh, I’d like to see the documents," when pressed by Mike Stark. She refused to say anything more. "I believe he is a natural born citizen of this country until proven otherwise. I want to see the evidence," Reichert told Stark. Reichert is evidently not watching enough cable television. CNN (with the exception of Lou Dobbs) and MSNBC have thoroughly debunked the birther conspiracy. But still Reichert says he needs to see "the evidence". Yeah, just like he needs to "investigate" whether the climate crisis is caused by human activity. It's alternatively sad and amusing to watch Republican congresscritters try to straddle this conspiracy by trying to stake out some "middle ground". Incidentally, this whole birther conspiracy illustrates the idiocy of the moderate myth: the idea that all political views in America can be arranged on a left to right or right to left line, with the cool-headed, or "moderate" folks in the "center". Republican congresscritters are trying to have it both ways by not explicitly disavowing the birther nonsense or wholeheartedly embracing it. They are, in essence, trying to play the old game of placing themselves in the "center" (because that's what reasonable people do...) but in a completely absurd context. If the moderate myth was not so widespread in our politics, perhaps this kind of nonsense would not get so much airtime. There is no middle ground and there are no scales concerning the issue of Barack Obama's citizenship. Barack Obama is an American, through and through. He was born on American soil in an American hospital in an American state. His birth was announced in American newspapers. He is - unquestionably - an American. The "evidence" has already been produced. There really isn't anything more than can be done to satisfy the people who don't believe the truth. Facts mean nothing to them since the facts do not fit into their frame. The frame stays and the facts bounce off. They are going to go on stupidly believing this myth, possibly for the rest of their lives, which is a very sad thought. In the meantime, the sideshow that they have created has seemingly morphed into a snake that has wrapped its coils around the Republican Party. Sane Republicans have busied themselves trying to quell the birther nonsense as best they can; a number of conservative bloggers have groused that the conspiracy is sucking up oxygen and causing trouble for various right wing political initiatives. Eventually, people like Lou Dobbs will get tired of propping this up and move on. Ratings are ratings. Until then, this pathetic sideshow will go on. Tim Eyman is at it again. In emails, blog comments, and private screeds to journalists, the professional initiative profiteer is continuing to distort the truth about Washington State's tax structure in an attempt to sell his latest wealth transfer scheme, Initiative 1033. Permanent Defense is distributing a media advisory tonight urging members of the media to avoid reporting Eyman's claims as facts. Some years Eyman has claimed we're the fourth highest taxed state; other years he has claimed we're the second highest. Now it's the eighth highest. Somehow, despite the implementation of two of his terrible initiatives by the Legislature - which have destroyed billions of dollars in funding for public services - we have remained in his mythical top ten. That's because the rankings he cites (both the Forbes Magazine rankings and the Tax Foundation's "Tax Freedom Day") are bogus. They use formulas that factor in federal taxes as part of the mix, and may also leave out local taxes, thus creating a truly distorted picture of things. That the people of Washington State, on average, pay more in federal income taxes than people in other states should not be surprising, considering that Washington is the eighth wealthiest state in the nation, home to billionaires like Bill Gates, Steve Ballmer, Paul Allen, Jeff Bezos, and Craig McCaw. The conservative Tax Foundation has a table that shows this. Of course, Eyman's initiatives have nothing to do with federal taxes - they can't - so including federal taxes in the mix is wholly inappropriate. The above chart, from the Washington State Department of Revenue, shows that only in recent years have Washington and its municipal governments begun to climb out of a historical decline in the percentage of taxes collected. In fact, the Forbes ranking, as well as the Tax Foundation's "Tax Freedom Day", are so misleading that the Washington State Department of Revenue had to issue a statement in an effort to stamp out confusion. Because it only compares certain state taxes and leaves out local taxes, the Forbes ranking fails to take into account some unique aspects of Washington’s tax system. Washington has a state school property tax levy that flows into the state general fund only to be redistributed to local schools. In other states, all property taxes for schools remain at the local level. The ranking also assumes that only individuals pay sales and property taxes, when in fact businesses pay a substantial share. Again, by percentage of personal income, Washington is the thirty fifth highest taxed state in the nation. Thirty fifth. That's a far cry from eighth. This may come as a shock, but across the United States, residents of Wyoming are the ones who pay the most in state and local taxes. That's correct... Wyoming! Maybe Tim Eyman should move there. Residents of other states... more than half of the Union... are thus actually investing more in their states than we are in ours. Eyman also fails to note that many residents of our state are eligible for programs that will reduce their property taxes. Washington State has deferral programs for senior citizen, disabled persons, homeowners with limited income, and a assistance program for widows or widowers of veterans. As to Tim's claims that "opponents continue to think only of themselves" (quoting from his email sent out to his supporters this morning), this is yet another example of psychological projection on Eyman's part. It is he and his followers who are selfishly thinking of themselves. Opponents of his Initiative 1033, meanwhile, are thinking about the devastating harm to our communities that Initiative 1033 will cause, the thousands of layoffs across the state, and the permanent recession we'll be trapped in. Opponents of Initiative 1033 are the folks fighting to preserve our communities. There is no such thing as a free lunch, as Eyman would unfortunately have us all believe. Public services - parks, schools, libraries, emergency medical response, police and fire protection - all of them cost money. If we want them - and we should, for they make our quality of life possible - then we must pay for them. And that means pooling our resources. We can't get public services any other way. Business and organized labor are joining the fight against Initiative 1033 because they have a stake in an economic recovery. No one will prosper if Initiative 1033 passes and wipes out Washington State's ability to pay for the public services we need and depend on. Eyman's assertion that his opponents are wealthy is also laughable. The major donors to the coalition that is forming to defeat Initiative 1033 each represent thousands of Washingtonians. Teachers. Nurses. Public servants. Furthermore, the staff of this grassroots organization (NPI/Permanent Defense), like many other activists who are gearing up to fight Initiative 1033, are not wealthy at all, and have invested countless hours fighting Eyman year after year trying to protect the public interest. Eyman's initiative, in contrast, is funded by Woodinville investment banker Michael Dunmire, who has supplied the overwhelming majority of funds for all of Eyman's most recent initiatives. Another top Eyman contributor is Eastside developer and Bellevue Square owner Kemper Freeman, Jr. who recently obtained a permit from the City of Bellevue to maintain a "heli-stop" downtown. Anyone who can afford to maintain helicopters in this economy is obviously wealthy. And there is a reason why Freeman and Dunmire have dumped so much money into Initiative 1033: They benefit from it. It's a big transfer of wealth from the wealthy to middle and lower income families, as Permanent Defense ally Steve Zemke has explained. The reason I-1033 constitutes a wealth transfer is that any revenue government collects that goes over the draconian artificial limit it sets would be distributed in the form of checks to property owners. Wealthy landowners who own multiple homes, strip malls, or large parcels thus benefit the most. These wealthy landowners include some of the state's biggest corporations, like Weyerhaeuser. While they are pocketing this money, services will be gutted, and Washington families will be worse off. It's all part of Eyman's cynical plan. Renters would be especially scammed by Initiative 1033, because they will lose out on services just like everyone else, but, unlike those who own homes, they will receive no money back. According to the most recent United States Census in 2000, only two thirds of homes in Washington are owner occupied. So besides gutting public services and destroying any chance of economic recovery in Washington, I-1033 will make our tax system more regressive. Working families will be punished. It's a lose-lose-lose. And that's why Washington must reject Initiative 1033 this November. It's a nasty scythe that would tear and shred the fabric that binds our communities together. We simply cannot afford for that to happen. Yahoo is close to making Microsoft's Bing its search provider. The deal, which would make Microsoft a more credible competitor to Google, is likely to be announced this week, and seems likely to be based on a revenue share, not on a big fat check upfront, as some at Yahoo had hoped. Yahoo's request for an upfront payment (it is said to have asked for several hundred million), in addition to revenue guarantees that would amount to billions over the course of the deal, caused a breakdown last week in the on-again-off-again talks. But they were revived late on Thursday, according to executives with knowledge of the situation. If this deal goes through, it'll be good news for the marketplace. A Microsoft/Yahoo alliance has the potential to finally create a true rival to Google in the search and advertising space, which the Mountain View based company currently dominates and is dangerously close to monopolizing. Yahoo's research and development efforts have sputtered of late as the company has tried to cut costs. New CEO Carol Bartz seems to recognize that Yahoo could be greatly weakened if it pursues a go-it-alone strategy. Allowing Microsoft to be responsible for search infrastructure makes a lot of sense because it would free up Yahoo's resources to be invested into strengthening the services the company offers around its portal (yahoo.com), still one of the Internet's top destinations. Yahoo has done this before. In 2000, it struck a deal to outsource search to Google, an arrangement that lasted until 2004. Arguably, that deal helped legitimize Google and turn it into the search giant it is today. ...Microsoft is well-positioned to take control of Yahoo's search business because several key former Yahoo search execs, including former Yahoo search chief Qi Lu, now work in Redmond and are intimately familiar with Yahoo's business. Microsoft will need to be patient. Steve Ballmer, to his credit, seems to realize that there is no way Google can be overtaken on its own turf overnight. Microsoft is going to have to keep improving its own product if it wants to lure users away from Google. A television campaign isn't going to cut it. Bing will actually have to deliver useful results for people to decide to make the switch. The Yahoo deal would, however, give Microsoft a quick pick-me-up and increase Bing's market share, thus making it easier for Microsoft to take aim at Google. The deal also promises to solidify the view that the software world is increasingly becoming dominated by conflict between Microsoft and Google. The two companies, as of next year, will be competing against each other in virtually every product category. By signing a pact with Microsoft, Yahoo is pulling a John Edwards and jumping out of the main action (as far as it is concerned) to let the two tech titans battle it out in search. Ever been browsing the Internet at work or at a friend's and wished you had your bookmarks with you so you look up the URL of that site you can't remember? A new Firefox plugin from the folks at Mozilla, known as Mozilla Weave Sync, allows users of the latest incarnation of the browser to easily and securely share their bookmarks, tabs/browsing history, settings, and even saved passwords across different computers. Installing the plugin is a cinch; getting set up is only slightly more difficult. To install, head over to Mozilla's Add-Ons site and click the big green button. Firefox will need to be restarted. Once it comes back up, click on the little chain rectangle in the bottom right corner of the browser (on the status bar). The Mozilla Weave wizard should appear. Clicking Get Started with Weave (the first big blue button) will initialize the process for creating an account. To protect user information, Mozilla not only requires a username and password, but a more complex passphrase as well. These credentials will need to be entered on each computer that shares Firefox bookmarks and browsing history. (Mozilla also encrypts information that is shared, to protect user privacy). After completing the wizard, Weave will do an initial sync of whatever information is selected by the user to be shared (users can opt to only share bookmarks, for example) to Mozilla's servers. The next step is to install Weave on a second computer running Firefox. (As long as Weave has been installed on and synced from the first computer, it's not necessary to have access to that machine to grab bookmarks to the second one). After Weave is installed on Computer No. 2, it's time to go through the wizard again, except this time, Set Up Another Computer is the option to choose. The wizard will sync the second installation of Firefox with the first. All of the first computer's bookmarks should be downloaded, as well as whatever other information a user has opted to share. Folks who don't want to share their bookmarks and browsing history with other people should (obviously) not install and use Weave on an installation of Firefox running in a shared environment. Those who serve as tech help gurus or computer administrators for friends or relatives should consider setting up their own accounts on such machines for when they do their own browsing. Weave is a pretty cool piece of technology, and once again demonstrates that Mozilla is leading the pack in the field of web browser innovation. The fearmongers behind the effort to force a public vote on Washington State's recently expanded domestic partnerships law announced this evening they have submitted 138,000 signatures to the Secretary of State Sam Reed's office. 120,577 valid signatures are required to qualify a referendum for the ballot. If the 138,000 estimate is correct, it would mean less than eighteen thousand extra signatures were submitted, which isn't much of a cushion. (The Secretary of State advises a cushion of at least twenty five percent extra signatures, to offset invalid and duplicate signatures). Communications Director David Ammons notes that typically, eighteen percent of signatures submitted turn out to be invalid. If the error rate on Referendum 71 conforms to that historical average, it won't qualify for the ballot. Forget eighteen percent, though. Referendum 71's fearmongering backers actually need an invalid rate of less than thirteen percent to qualify for the ballot. But such a low error rate isn't an impossibility. The Secretary of State's office cheerfully reported last week that Tim Eyman's Initiative 1033 (which has already qualified for the ballot) had a very low invalid rate of twelve percent. So we're in very marginal territory. This could go either way. It all depends on how many invalid or duplicate signatures there are. If there aren't many, Referendum 71 qualifies. If there are, it doesn't qualify. 9,359 petitions were submitted; for an average of about fourteen signatures per petition (again, assuming the estimate of 138,000 signatures is correct). So unfortunately, there isn't much news regarding Referendum 71 to share today. Whether it qualifies or not is still an unresolved question at this point. Washingtonians are urged to be extremely cautious over the next few days to minimize the risk of fires, the Department of Natural Resources warned tonight. Public Lands Commissioner Peter Goldmark and his team are calling conditions extremely dangerous. Dry, hot weather is partly to blame for the increased risk, explained Assistant Division Mark Gray. "This next seven days will be some of the highest fire danger levels we’ve seen in recent years, for the Westside as well as the Eastside," he said in a statement emailed to the Northwest Progressive Institute and other media organizations. Recent thunder and lightning storms have sparked nearly three dozen fires in differen parts of the state. Almost all of them are smaller than two acres, and have been contained by a firefighting force encompassing two hundred firefighters, thirty six fire engines, and nearly half a dozen helicopters. Fires not started by lightning are typically caused by human activity: a careless smoker throws a cigarette into a patch of dry brush, burn bans are disobeyed, or someone is fooling around with a lighter. Such fires can be avoided; all that's needed is a little uncommon sense. DNR suggests that campers, hikers, and outdoor enthusiasts check local conditions and restrictions by calling 1-800-323-BURN (2876) or visiting DNR's website. Sound Transit has now run five light rail trains through the Downtown Seattle Transit Tunnel with proper functioning of the signal system. Trains are carrying passengers in the tunnel again. So far the system is working fine. The service disruption was only limited to the tunnel; Sound Transit trains continued to operate between Tukwila International Boulevard Station and Stadium Station in South Downtown during the outage. The Downtown Seattle Transit Tunnel is the only tunnel in the world with transit stations served by both trains and buses. The tunnel’s unique joint operations framework depends on a control and signal system that is integrated with fire safety equipment and can be operated remotely. Safety is Sound Transit and King County Metro Transit’s top priority, and transit service is subject to disruption if the system is not functioning properly. Sound Transit did the proper thing by taking trains out of service. If they hadn't and there had been a collision or mishap as a result, critics would be howling about that, trumpeting it as loudly as possible. Whenever a brand new piece of infrastructure comes online, there are inevitably bugs and glitches somewhere - even if they are minor - that have to be worked out. Light rail is still new to us. Given time, the system's reliability will become obvious, and communities that don't have it will clamor for it. ALSO: Ben Schiendelman has a great post at Seattle Transit Blog about little things he'd like to see from Link. Can't argue with his list. The King County Municipal League, the county's best known "good government" group, today released its candidate ratings in select races for the 2009 primary election, surprising a number of political observers with what several readers of The Advocate have privately characterized to NPI as blatant favoritism towards developer-friendly candidates with a background in business. Perhaps most surprising is that in the county's two marquee races (King County Executive and Mayor of Seattle) only one candidate received the Municipal League's top honors of "Outstanding": Joe Mallahan. That sentence seems like it might well apply to any of the elected Democrats running for County Executive, particularly Larry Phillips and Dow Constantine, who have fought uphill battles against powerful interests (in Dow's case, Glacier Northwest), perservered for years to expand mass transit, and repeatedly strived to protect county residents' quality of life. And in fact, Dow Constantine and Fred Jarrett did receive "Outstanding" ratings from the League in their last campaigns (for County Council, District 8, and State Senate, 41st Legislative District). But not this year. Mallahan's chief competiton for Mayor of Seattle - Greg Nickels and Jan Drago - were likewise rated "Very Good" and "Good" respectively, one level below what each were rated in 2005. Nickels was "Outstanding" then, while Drago was "Very Good"; they apparently aren't any more. Nickels' contributions to the City have also seemingly diminished in the League's eyes. The lower rating for Nickels is especially ironic considering it was released less than a week after one of the opening of Central Link, which ranks perhaps as Nickels' biggest lifetime accomplishment in office. (Believe it or not, the Muncipal League even presented Nickels with the James R. Ellis Regional Leadership Award for his championing of Central Link at their fiftieth annual civic awards a few months ago). Meanwhile, Mallahan, a first time office-seeker, got an "Outstanding" rating. We can't help but ask, what's up with these ratings? Has experience in government suddenly become less valuable or something? There's something to be said for bringing in new blood into the political arena. But to suggest that the "knowledge, involvement, effectiveness and character" of so many incumbents has lessened over the last two to four years - which is the message the lower ratings convey - is very, very strange. (Those quoted traits are the four criteria the Municipal League uses to determine its ratings, according to its news release). A complete listing of the Municipal League's ratings for this election cycle are available at their website (PDF) complete with an introduction. In an historic move, Microsoft Monday submitted driver source code for inclusion in the Linux kernel under a GPLv2 license. The code consists of four drivers that are part of a technology called Linux Device Driver for Virtualization. The drivers, once added to the Linux kernel, will provide the hooks for any distribution of Linux to run on Windows Server 2008 and its Hyper-V hypervisor technology. Microsoft will provide ongoing maintenance of the code. Wow. Does Steve Ballmer know about this? Microsoft made the announcement at the annual OSCON open source conference that opened Monday in San Jose. Greg Kroah-Hartman, the Linux driver project lead and a Novell fellow, said he accepted 22,000 lines of Microsoft's code at 9 a.m. PST Monday. Kroah-Hartman said the Microsoft code will be available as part of the next Linux public tree release in the next 24 hours. The code will become part of the 2.6.30.1 stable release. "Then the whole world will be able to look at the code," he said. Well, gee. Who could have ever imagined Microsoft releasing any code under a free software license? What a pleasant surprise. We sure hope this is merely a sign of things to come. We at the Northwest Progressive Institute are strong believers in interoperability - the property that things should be able to work together. The concept is important in software because without it, there cannot be a free exchange of information. The free software community has long accepted and cherished the idea, and it seems at long last Microsoft is starting to come around. We extend our congratulations to Sam Ramji, Microsoft's director of open source technology strategy, for this breakthrough. One of the biggest weekends, infrastructure wise, in the history of this region is finally coming to close as Central Link Opening Weekend winds down. It's still a bit difficult to believe that the trains are really, truly, and surely here to stay for good. Central Link is no rail exhibition brought in from some other town (if such a thing could even exist) thought that is what it seemed like at times this weekend. Rather, it is greater Seattle's newest and greatest way of getting around. Five months from now, Sound Transit will be inaugurating service on the last stretch of the initial line (Airport Link) which will bring light rail directly into SeaTac. Then, in seven years, University Link will open, bringing light rail under Capitol Hill and the Montlake Cut into the state's largest center of higher learning. For now, it's possible to travel from Tukwila to Westlake Center and points in between without ever getting stuck in traffic, thanks to Central Link. Interest in the line was high for Opening Weekend. Sound Transit counted approximately 92,000 boardings in all, including 41,000 today. That's an initial estimate; the figure may rise tomorrow morning as Sound Transit gets more complete data, as it did this morning (45,000 boardings were estimated yesterday, but the revised number released this morning was 51,000). Opening Weekend also disproved (as we knew it would) one of the most outrageous myths that anti-rail fanatics have long propagated: that light rail only siphons riders from buses. In reality, light rail attracts a large number of people who would otherwise drive if the only transit option were buses. It wasn't hard to find people on Link this weekend who don't normally take mass transit. There were even riders who had never tried public transportation before. They joined those who have been waiting, waiting, and waiting for this weekend all their lives: greater Seattle's rail advocates, many of whom have traveled extensively or are transplants from other cities that have rail. Many of them led in the cheering during boarding of Link trains, and cheering again when the train rolled away from the platform. A huge congratulations to Sound Transit for fulfilling high expectations this weekend. The agency successfully accommodated big crowds with no catastrophes or major breakdowns. There were merely a few minor inconveniences here and there, like a broken escalator or stuck elevator (that had no one in it). The reliability of light rail was showcased for all to see. The trains ran and ran smoothly. Stations were extremely well manned by event staff. There was musical entertainment, drinking water, and plenty of information about riding the system at pretty much every station. Lines weren't too bad and most people seemed to be happy with the crowd control. The Sound Transit team, led by Chief Executive Officer Joni Earl, put in very long hours and are to be commended for a job well done. Ten hours ago, the people of Seattle and greater Puget Sound finally got the opportunity to experience Link light rail for themselves firsthand. Sound Transit is reporting that some 45,000 riders tried out the system on its very first day, which the agency considers very solid turnout. Based on conversations I've had with riders today, and reporting by the traditional media, there's a clear consensus: Link light rail is a sweet and much needed improvement to our region's transportation system. 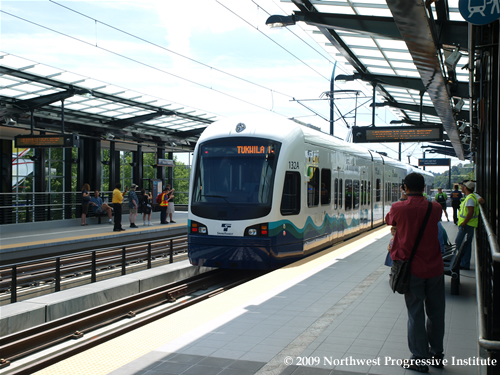 Above: A northbound Link train coming from Columbia City pulls into the Mount Baker Station on elevated tracks. Sean Parghi was one of the early riders on the train. He said he took it to get to Seattle for the Sounders game at Qwest Field. "This is history," he said. "We're super-excited, definitely. I love public transit, and this is great." Arlene Cooper, a mother of two, said the light rail will give her and her family "another option." "We'll walk down here (to the station) and take trips downtown," she said. "We save money on parking, and we have bus passes, which we can use on the light rail - so it works out perfectly." Vu Han of Everett, who said he has never ridden light rail before, described the train as "very convenient." Many other riders described the train as clean and easy to use. The Clemmons' made a family day out of it. "We're riding it for fun, because it's brand new and very exciting," said Delijah Clemmons. Onboard their packed rail cars, riders enjoyed competing with motorists outside, but without the worry of a traffic jam. "It's so fast. I didn't know we were out of downtown, and its five minutes and we're already in south Seattle," said DeMarco Grant. "It's really clean, really nice compared to a lot of the other public transits we have around here. It's also a lot smoother and quieter than a lot of the t-stations you'll find around," said Isabella Pelegero. Daniel Gonzalez cheered and clapped when a train arrived at a station. "It's about time we had one of these," Gonzalez told The Seattle Times. "It's quiet and efficient — the wave of the future." New York resident Maxwell Simon liked Seattle's new mass transit line better than the Big Apple's. "New York doesn't have anything as nice as this," the 87-year-old Simon said. "I want to be part of Seattle history. I think New York is going to learn a lot from Seattle." SU_Spectator: Rode the light rail from Beacon Hill to Westlake. Very smooth, very fast. Better than buses. abosco: Rode the light rail! Awesome - only a short wait for return trip.can't wait until 2016, when it will leave from our doorstep. iangilman: It's a sweet ride! mattsbasement: handed out tons of light rail stickers. rode the train to beacon hill and back it is amazing. build lots more! Building more light rail is what Sound Transit 2 is all about. But judging by the obstacles that had to be overcome to get Central Link constructed, we've still got a lot of work ahead of us. There are critics and naysayers out there who view the completion of this line and the passage of Prop 1 as nothing more than setbacks. 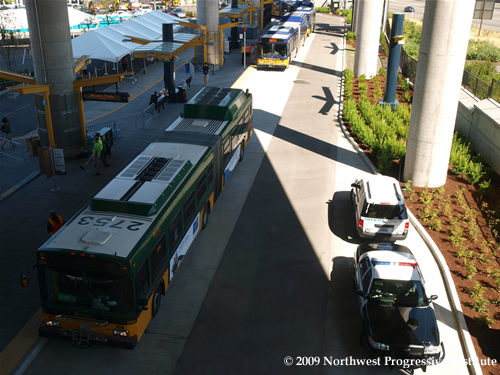 Above: Two buses wait to pick up passengers in the bus bays below the train platform at Tukwila International Boulevard Station. We're going to have to be on guard against attempts to sabotage the expansion the voters approved, especially when it comes to East Link. But for now, this glorious weekend, we rejoice and celebrate. Reliable rapid transit has finally come to Seattle for good. Sound Transit has formally and informally issued a number of tips and advisories so far about riding Central Link. Figured I'd post a bunch of these for people who are thinking of taking the train tomorrow. First, Link information is not yet available in the online regional trip planner which is offered by King County Metro. It is expected to be available in a few days. Second, shuttles are not yet operating between Tukwila International Boulevard Station and SeaTac International Airport. A few commenters have wondered about this over at the Seattle Times' website. Shuttle service starts Monday, July 20th. They're supposed to run every fifteen minutes between the airport terminal and light rail terminus, although the released schedule shows seven minutes for weekdays and nine minutes for weekends. Third, the electronic readerboards in the stations are in fact equipped to display information about incoming trains (estimated time of arrival) but this functionality won't be operational for at least a few days. Getting the audio cues and LED screens on the trains to work was a huge undertaking in itself. That's what Sound Transit's Paul Denison (the guy in charge of all the trains) told NPI yesterday. 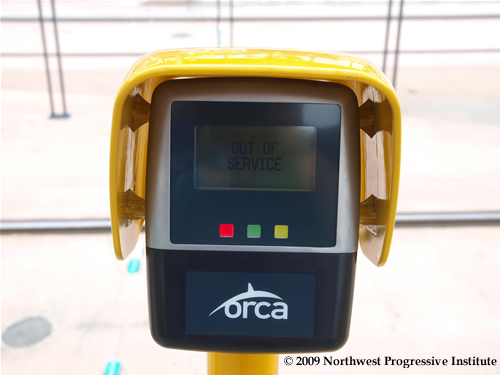 Fourth, regarding fares, riders are supposed to be able to pay via ORCA beginning Monday. To pay with ORCA, simply tap the smart card to a reader before entering the platform, and then tap it again after exiting the train. For those buying good old fashioned tickets, there are ticketing machines. The adult base fare is $1.75; with five cents added per mile traveled. So it's necessary to figure out where that trip is ending in advance of buying a ticket. Travel Light... The journey begins! After a festive ribbon cutting at Mount Baker Station in the cool morning hours, and two Inaugural Trains (one northbound, one southbound) Sound Transit has officially launched service on Central Link, Seattle's first modern light rail system. 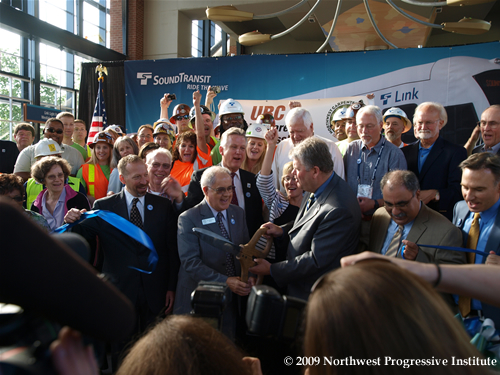 Above: Mayor Greg Nickels cuts the ribbon to mark the grand opening of Sound Transit Central Link Light Rail. KIRO radio host Dave Ross served as the master of ceremonies for the grand opening at Mount Baker Station, before the arrival of Mayor Greg Nickels. Nickels and a host of speakers (Congressman Jim McDermott among them) spoke proudly of the years and years of hard work that made today possible, then, the great ribbon was cut, and a stream of politicians, reporters, and lucky Inaugural Train ticketholders made their way up to the platform. 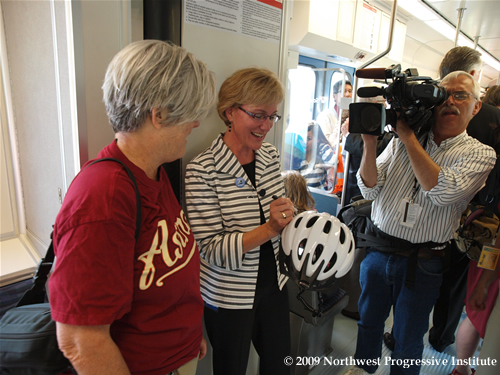 Above: Sound Transit Chief Executive Officer Joni Earl signs a bicycle helmet onboard the Inaugural Southbound Ride of Central Link. 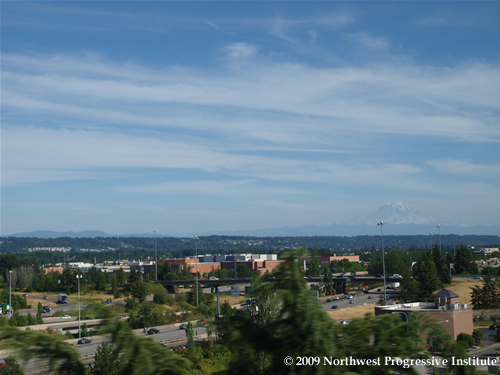 I took the southbound train to Tukwila International Boulevard Station, passing through the Rainier Valley and on the aerial trackway above Interstate 5 and the Duwamish River. 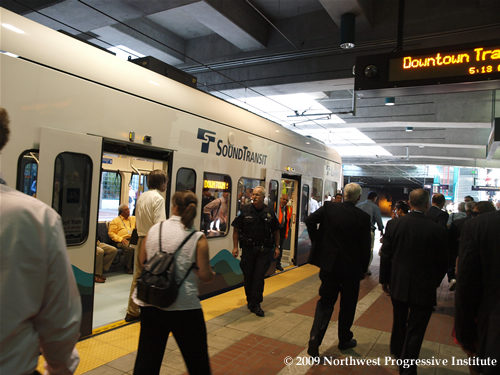 As we returned north, Sound Transit initiated service. We saw people getting on board trains at the Stadium Station, International District, Pioneer Square, University Street, and Westlake Center Stations. I detrained a little bit ago and am now sitting in the plaza at Westlake Center enjoying the sunshine, and blogging about the launch of Central Link. I'll be heading south again shortly. I'm pleased to report that there are hardly any crowds and no lines at most stations, so getting on the trains is a breeze. 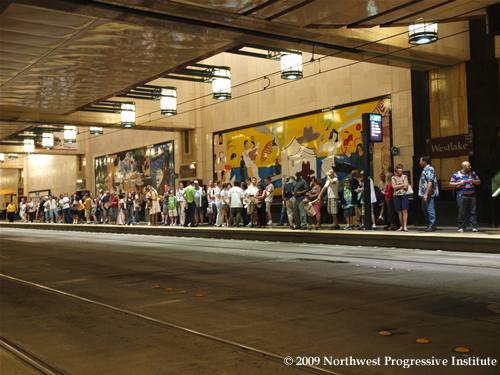 Above: Riders wait for a southbound Link train to arrive at Seattle's Westlake Center platform in the Downtown Transit Tunnel. I think Sound Transit and the media did an effective job of scaring people about overflow, so the morning has not been hectic at all for people wanting to ride, or event staff manning the Welcome Portals at the stations. Things should probably pick up in the next few hours. My advice: Come on down (or up!) to the nearest station as soon as you're able, and hop on board. It's easy, fast, and fun. The trains are runnin' - come and catch one while the crowds are still light! Above: A Link train leaves the Mount Baker Station, heading southbound for Columbia City, the next stop on the line. BEACON HILL IS COOL: The Beacon Hill Station is arguably the coolest in the system, in part because it's buried underground. (Yes, pun intended!) The tunnel walls in the station are painted a dark blue. The station is decorated with sculptures and etched carpets that suggest an industrial, space theme. It's a beautiful, airy, comfortable station. Four speedy elevators provide a quick connection to the neighborhood over a hundred feet above. Above: A Central Link train stops at Beacon Hill Station to offload and take on new passengers during Opening Weekend. WHO NEEDS A SCHEDULE? I'm back at Mount Baker, uploading a few photos I shot this morning. It's fun to watch trains roll in and out of the station as they enter or exit the Beacon Hill Tunnels. They come so often that there's no need to check a schedule to find out when the next train is due. Just walk up to the platform and a few minutes later, a train will show up. Above: View of a northbound train pulling into Mount Baker Station. Link trains run every seven and a half minutes during peak hours. Sound Transit estimates there have been about 13,000 riders so far today. That's 13,000 in just a little over two and a half hours. Trains are full, lines are short, it's a nice sunny day... take a trip on Central Link and Travel Light! NEW RIDERSHIP NUMBERS: As of 3 PM, Sound Transit estimates 30,500 or so riders have boarded a Central Link train so far today. Not bad. Have to wonder if they're being too conservative with the numbers... every single train I've been on today (more than a dozen!) has been standing room only. Seats are only widely available when boarding an empty train at Westlake or Tukwila. 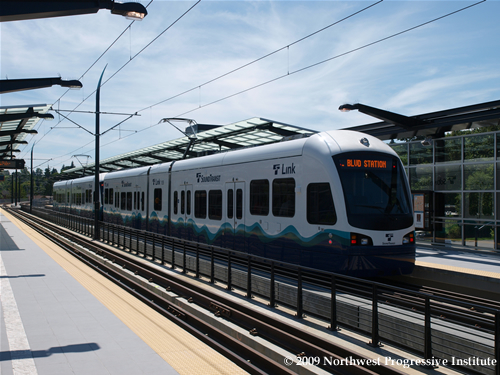 Sound Transit's Bruce Gray reports that "Sunny skies and activities at neighborhoods along the line have combined to make a great start of service. Wait times have been minimal, generally in the neighborhood of fifteen to thirty minutes with longer wait times at the International District/Chinatown Station and Stadium Station immediately following the Sounders soccer match." T-Minus twelve hours and counting....till the opening of Sound Transit Central Link! What a weekend this is going to be. We at NPI are still having trouble getting over the notion that the years of talking, arguing, waiting, and litigating is over. Sound Transit's Central Link light rail is finally commencing operations. Finally. It's a dream come true. For a city that has lacked a rail spine for oh-so-long, tomorrow's launch will be like celebrating the arrival of a new century. Almost every major city in the United States has a rail system, but for what seems like an eternity, Seattle and suburbs have not, because we foolishly dismantled ours decades ago. Ever since we the people of this region realized that mistake and voted in favor of building light rail back in 1996, we've been patiently waiting for this line to open. Some of us have fought valiantly for years to defend the project against legions of critics and naysayers who tried to do everything in their power to stop progress. Fortunately, we succeeded and they failed. When I got involved in politics in 2002, it was to defend Sound Transit from the likes of Washington's Grover Norquist clone, Tim Eyman. At the time, the agency was under fire from almost all quarters and struggling to rebound from a series of diastrous missteps. But I believed that Sound Transit was trying to fulfill an incredibly important mission, and I made a point of standing up for the good people that work there. My faith in them has been vindicated many times since then. Under the leadership of Joni Earl, Sound Transit has become more transparent, more accountable, and more effective than almost any other government agency I could think of. Polling in recent years has that the public trusts ST more than it trusts WSDOT (Washington State Department of Transportation) or Metro. ST's policy of under-promising and over-delivering has served our region well. 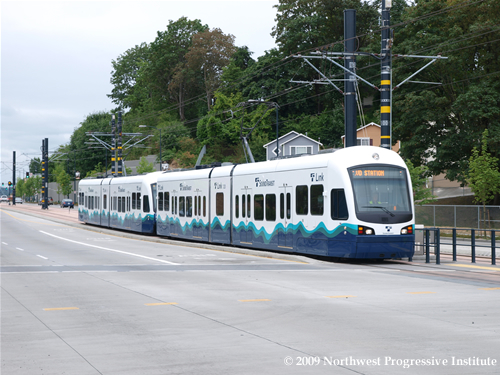 Since 2001-2002, Sound Transit has successfully expanded Sounder and ST Express bus service, opened new park and rides, debuted new HOV access ramps, launched the Tacoma Link streetcar, and built Central Link light rail, as well as breaking ground on University Link and winning voter approval of Sound Transit 2. What they've accomplished in the span of seven and a half years is amazing. SOUND Transit's shiny debut of light-rail service is a notable exclamation point on four decades of debate, frustration and admirable tenacity. A long-held vision for the region is celebrated with the opening of a 14-mile line between downtown Seattle and Tukwila, one stop short of Seattle-Tacoma International Airport . That connection is scheduled to open by the end of year. Light rail has been 41 years in the making, with a first failed vote in 1968. Voters eventually endorsed light-rail construction in 1996, and they held the dream through budget disasters, management implosions and a steady drumbeat of skepticism and opposition, including our own. Even though Central Link is done, there are still people out there finding fault with it. Like the grumbling over parking, for instance, which the media has been playing up. They're several years behind the times. The decision was made long ago not to build a plethora of garages along this line (or raze property for big asphalt lots) because that would require precious resources to be wasted doing something we already do too much of: subsidize the automobile. Building new park and rides, especially where there aren't any now, merely encourages people to drive more. That defeats the most important objective of building rail, which is to revitalize, strengthen, and create true neighborhoods. And it's a win-win: Developers love investing in properties around rail lines because they know they can count on the rail line being there when they decide to redevelop. That's not the case with bus routes, which are confusing and frequently changed by transit planners to accomodate rider demand. Neighborhoods cannot be built around buses, but they can be built around streetcars and light rail. The opening of Central Link will put to the test how well Sound Transit has designed our region's first light rail line. Judging by the number of skeptics the agency has won over already, and the positive change that's occuring in the Rainier Valley, Link is poised to bring great public benefits to the thousands of people who live nearby it in the months and years to come. LIVE from Link: Let the celebration begin! Light rail opening weekend is finally here. In less than twenty four hours, the wraps will be taken off Central Link, the Puget Sound region's first modern light rail system, at long last giving us what we have badly needed for so long: the beginning of a rail backbone. So many people have been invited to today's special preview ride (the very last preview ride of them all!) that Sound Transit expects to pack full three cars full of dignitaries: elected officials, business representatives, labor leaders, policymakers, transit activists, and members of the press. Many of the dignitaries on today's train ride hail from the statehouse. Senators, representatives, and staff for the governor's office are all on board, riding Link light rail for the very first time. Among those here are Fred Jarrett and Ross Hunter, both candidates for county executive who have served in the Legislature, Cindy Zehnder, chief of staff for Governor Chris Gregoire, State Senator Ed Murray, and Representatives Marcie Maxwell, Tina Orwall, and Scott White. 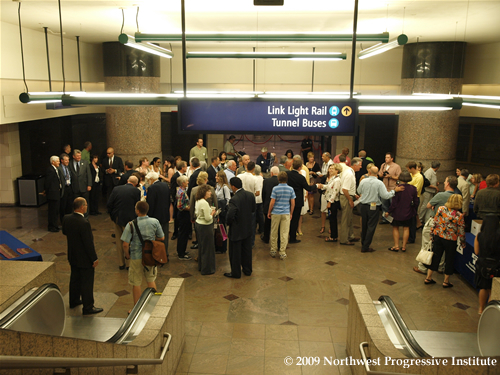 Before we descended to the platform to board the train, we were treated to a series of speeches from the elected officials who led the way to get Central Link built, chiefly Seattle Mayor Greg Nickels and Senator Patty Murray. "You helped make this happen," Nickels told the assembled crowd. He specifically thanked Jim Ellis and Aubrey Davis for their vision, essential to the success of Link light rail. He then honored the memory of former legislator Ruth Fisher, the sponsor of the legislation that created Sound Transit. Senator Patty Murray also spoke, referencing again and again the early obstacles that Sound Transit had to overcome. She expressed appreciation for the more than four thousand people who took the project from blueprints to reality. We wanted an environmentally-friendly transportation system to reduce congestion, increase commuter options, and lay the foundation for economic growth. But, while our vision was clear, the path forward often wasn’t. As a member of the Senate committee that oversees federal transportation funding, I secured 3 million dollars so Sound Transit could do the early planning to apply for the federal commitment they needed long-term. But Sound Transit stumbled. They were over budget and deadline and lacking oversight. That hurt us in D.C. And I knew if we didn’t get a $500 million agreement signed by the end of the Clinton Administration, we never would. So, the night before President Bush was sworn into office Norm and I sent our staff to camp out in Transportation Secretary Rodney Slater’s office until he signed on the dotted line. At 8:30 PM – 16 hours before Inauguration - he did. But the job was just beginning. I went into tough mom mode. I demanded Sound Transit get its house in order. I put them in time out: No funding until they got it together. I worked with Joni and others to make sure we could answer the tough questions. Sound Transit stepped up and convinced Congress and the Administration not to give up on them. We refused to let our economic growth be held captive by those early problems or political gridlock. The speechifying went on for more than forty minutes, as Murray and Nickels were followed by more than half a dozen speakers from around the region. The speechifying also caused a big part of Westlake Station to be closed off, inconveniencing hundreds - perhaps thousands - of riders who could not figure out why some of the stairways, escalators, and entrances were roped off and guarded by police. We also blocked the platform at Westlake on one side for several minutes, waiting for the buses to clear out and head south. But we did all finally manage to make it onto the train. And then - behold, the audio cues! They're finally working now, an awesome flourish to a magnificent train system. The cues announce, in loud, friendly tones, what the next station is and which direction the platform is (Doors to my right, for example). It's a warm, friendly female voice. Sounds a lot better than my GPS system. We have just come out of the Downtown Transit Tunnel and are heading through SoDo (South Downtown) to the Beacon Hill Tunnels. I will update this post with more info as the ride progresses. MORE: Also working are the LED screens. They no longer say Sound Transit, but instead report what the next station is, as well as the terminus of the line. The LED screens and audio cues help make Link much, much easier to ride for travelers and people new to Seattle than buses. The air conditioning appears to be on full blast, which is good because it's a very warm day and there are quite a few of us packed inside each of the three cars that are coupled together in this train. We're not at crush load, though, which is good, because otherwise I wouldn't be able to take pictures or shoot video. HEADING NORTH: We stopped for a five minute or so intermission at Tukwila International Boulevard Station. Most of us who were on the first car going south walked around to be on the first car going north as well. REMEMBERING: Getting this system built took a big, big effort. As we cruised north through the Rainier Valley and SoDo, I talked with Mayor Greg Nickels and Joni Earl about many of the hurdles Sound Transit had to clear to get Central Link built. We also talked about the future - getting Link extended north, south, and east. Eventually, Sound Transit may color code the lines, as is done in other cities, to help people find their way about the region. WHAT ABOUT WI-FI? One of the great things about these rides is that you can get fast answers to questions. I asked Mayor Nickels if the trains have wi-fi capability; he didn't know, so he asked Joni Earl. Joni didn't know, but she whipped out her BlackBerry and sent a message asking about it. Turns out the trains are not currently wired for wi-fi, but they apparently could be, and possibly may be in the future. Something to ask the Sound Transit Board to look into the months ahead. WE'RE BACK: Just got off at International District/Chinatown Station. I'll upload a few pictures later tonight - hopefully I got some shots that aren't identical to what we've published in the past. I'll check in later! Real transformation in education still elusive: How do we get to where we need to be? Editor's Note (Kathleen): The following is the second in a two part series of guest posts authored by longtime education advocate and activist John Stokes, whom we are pleased to welcome to The NPI Advocate. John's perspective has been shaped by his years of work as a local, state and national Parent Teacher Association (PTA) leader and as a Bellevue Schools Foundation trustee. John has served on numerous committees within the Bellevue School District and the state, and in political and bond and levy campaigns, and is a recent appointee to the Bellevue Parks Board. He was instrumental in mobilizing parent and community members to lobby for successful passage of the major education reform bill, ESHB 2261. After decades of advocacy for an updated definition of basic education, including aspects that are widely considered to be included as part of the educational experience the state offers all of its students, and more recent insistence that we transform our school environment at the district level, the Washington State Legislature passed ESHB 2261. As I noted previously, real questions remain as to whether this promise and ambitious plan will ever be implanted in anything close to the ideal set out in the bill. Taking into account the several hurdles before this realization, I want to suggest that there is hope for real change despite the odds. The overarching need for substantial change is in our tax system. While 2261 sets up a finance group to recommend a new system to more adequately fund public schools, without systemic change in Washington’s current reliance on property, sales and gross receipts taxes to fund its schools and other public services, all of our plans and dreams for a quality school system that prepares our kids to compete in the global economy and even make a decent family wage will not come to fruition. The money is there, the problem is the tax system does not provide sustainable revenue for our common wealth. Changing this situation will take the concerted effort and the imaginative action that columnist Neal Peirce talks about. Elected leaders, businesspeople, and teachers all need to be on board to make this a reality. Also involved must be the parents and families of all our children whose life experience depends on a good outcome of this effort. The excellent networking of parents and school activists that helped make the difference in getting 2261 enacted will have to be significantly elevated in intensity and strength to help push through tax reform. Work has to start on this now, but it can be done. In order to make the first item really work in the long run, we also have to make sure that the specified groups in the bill, and the Legislature, do their jobs to push the work forward to implement the plan in 2261. Unless there is some positive sign of a real attempt at changing the system, parents and taxpayers will not buy into providing more money for schools above some marginal increase. The Washington State PTA, the League of Education Voters and Stand for Children, along with other education organizations, are already working to get us on the path to real reform. Education advocates must come together and work together. We have to find ways to work collaboratively with the teachers union, the Washington Education Association. Other unions, WSSDA, WASA and others, will have to take hard inward looks and change in order to be more nimble and effective working with parents and the business community to get this job done across the board. The change that President Obama has championed and which Peirce espouses must come about through citizen action so that the goals of a stronger and more competitive America is possible, and naysayers and anti-tax people must not be allowed to dictate policy and the direction of the state in this century. The money is there, the Great Recession will not last, and the needs of the children must not be sacrificed for the immediate gratification of a minority of the population. We can do it if we believe. Longtime Tim Eyman publicist, er, I mean, former Associated Press reporter David Ammons, now serving as the Secretary of State's Communications Director, has just put out a gushing press release announcing that Tim Eyman's Initiative 1033 has passed a random sample check on more than 315,000 submitted signatures, thus ensuring its placement on the November 2009 ballot. Initiative 1033 is Eyman's scheme to lock in all of the budget cuts the Washington State Legislature foolishly made back in the spring. It says that government cannot spend more revenue than what it took in the previous year, guaranteeing the State, its counties, and its cities will quickly run out of money and be forced to start laying off teachers, firefighters, and countless other public servants. So it's official: we have another vindictive, destructive Eyman initiative on our hands that must be beaten back. We expected as much, but it's never fun to have to be concerned about the risk of a gullible electorate accidentally short-circuiting Washington State into a permanent recession by voting for this. Meanwhile, Tim Eyman is busy shaking his electronic tin cup again, asking supporters to pony up for his personal compensation fund, Help Us Help Ourselves. Progressive activists have been wishing for a long time that Eyman would just pack up his bags and move away (not that we'd wish him on any other state) so that our state's quality of life wouldn't constantly be under assault by right wing initiatives. But the reality is, the only way to put Eyman out of business is to build infrastructure to deconstruct his initiatives. That's why Permanent Defense exists - to provide a year round first line of defense against right wing ballot measures. As I've noted to the Seattle Post-Intelligencer's Joel Connelly, I-1033 will not be defeated by a handful of paid consultants working out of an office furnished with money from organized labor and Washington's largest business. It's going to take boots on the ground, clear and concise two way communication with voters, and creative use of resources to bury this horrible initiative for good. We all have a stake in this fight, and we have a lot of work to do. Hours after The Seattle Times ran a big headline in its morning edition blaring that Washington State had been snubbed when the United States Department of Transportation announced ferry grants, the feds have taken immediate action to soothe the egos of the state's most powerful politicians, and ensure the nation's largest ferry system gets a healthy slice of funding. This is great news for Washington state and our ferry system. I thank Senator Murray for her leadership and determination to secure this funding. Washington, with the nation’s largest ferry system, has now received the most federal recovery funds for ferries, as it should. Does she have to make it sound like we're entitled to the money? Maybe a little more gratitude for this speedy reversal of fortune would have been in order? The governor is reliant these days upon federal grants to keep a steady stream of positive press releases coming out of her office, after she and the Legislature uncourageously decided not to raise revenue to offset painful budget cuts. It's not yet clear how WSDOT intends to use the money, but we'll ask. It might be invested into that new terminal in Anacortes that WSDOT wants to build. Editor's Note (Kathleen): The following is a guest post authored by longtime education advocate and activist John Stokes, whom we are pleased to welcome to The NPI Advocate. John's perspective has been shaped by his years of work as a local, state and national Parent Teacher Association (PTA) leader and as a Bellevue Schools Foundation trustee. With the adoption of ESHB 2261, Washington has taken bold steps toward reforming - and some say, transforming - its K-12 public school system. Considering where we are coming from, great strides were made by the Legislature in the 2009 session toward this goal. This bill expands the definition of basic education and sets forth significant steps for achieving a new education system to meet the perceived needs of the 21st Century and the global economy. Of great concern, of course, is the money. Best estimates of the additional cost for actually implementing the plans of 2261 are anywhere from $2 to $6 billion a year, real money any way we look at it. Will legislators have the gumption to step up and jump through hoops to get real tax reform in place that will alleviate our state’s gross revenue swings and provide for the additional funding? Will the latest Eyman initiative be embraced by a gullible public? Will education advocates have the staying power to keep up the pressure on the legislators all the way through expected completion of the work in 2018? Even more fundamental, is the question of whether this state is ready to make any real change, to move into a more equitable, progressive and truly transformational way of providing the best education it can for all of its children, and to tackle the challenges of the best use of current funding and whether the way we currently educate kids is the best for the future? In a recent op-ed column, syndicated columnist Neal Peirce poses a question that touches on and deals with these concerns. He asks whether the states are up to dealing with modern challenges and problems, noting the widespread ineffectiveness of states to effectively deal with the urban and suburban realities of life in the United States in 2009, when they are products of and largely controlled by the two hundred-year-old concepts and notions of a more rural and scattered country. [T]he states could focus on their indispensable priorities. A lead item: to restore the quality and affordability of their community colleges and state universities. Another: to provide social safety nets, plus incentives for personal advancement, for underprivileged populations, rural or urban. And finally: to brush aside "dump the tax" movements and courageously raise taxes enough to finance forward-looking investments. It seems to me that Mr. Peirce has zeroed in on the fundamental roadblocks to Washington state ever moving beyond incremental and inadequate change in the education system. Until we meet our self-imposed limitations that hobble efforts to make this state work for all of its citizens, we will still be talking about the need for transformation ten, twenty years down the road. In the meantime, whole generations of our children will be denied an adequate - let alone excellent - education, and our economy and quality of life will continue to be compromised and stunted. There are solutions out there, and there is hope for a new way forward, which I'll discuss in a forthcoming sequel to this post. Several pitches into the 2009 Major League Baseball All Star game in St. Louis, Missouri, the Seattle Mariners' champion right fielder, Ichiro Suzuki, lined a pitch from National League starting pitcher Tim Lincecum into right field for a single, giving the American League its first hit in the contest. The score, as of this writing, is two to nothing. The American League has two hits, two runs, and no errors. The National League has one error, charged to St. Louis' hometown baseball hero, Albert Pujols. Earlier, President Barack Obama was on hand to throw out the ceremonial first pitch to Pujols, which landed, after arcing, in the first basemen's outstretched glove. Obama was greeted by fans at Busch Stadium with a standing ovation. Obama also visited All-Star players in the locker room. Fox Sports showed the President signing a baseball for Ichiro, and kidding around with Pujols and the winner of last night's Home Run Derby, Prince Fielder. Obama later showed up in the broadcast booth to chat with announcers Joe Buck and Tim McCarver. The pair joked around with Obama about his White Sox jacket and the luck he brought the team after he threw out a pitch as a senator several years ago. (That was the year the White Sox went on to win the World Series). Also appearing in tonight's All Star game, by the way, is Seattle ace Felix Hernandez, considered by many baseball observers to be the game's most promising pitcher. Hernandez will be pitching in relief later in the game. UPDATE II: Game's now tied at three to three. The Mariners' Felix Hernandez pitched a perfect sixth inning for the American League, retiring each of the three batters he faced by getting them to ground out.... including Albert Pujols, who left the game hitless. Pujols did redeem himself after his first inning error with a handful of very good defensive plays, however. UPDATE III: American League wins, 4 to 3! Hurrah! I will not vote for—no senator should vote for—an individual nominated by any President who believes it is acceptable for a judge to allow their own personal background, gender, prejudices, or sympathies to sway their decision in favor of, or against, parties before the court. In my view, such a philosophy is disqualifying. Here's Justice Samuel Alito, during his confirmation hearing before the Judiciary Committee. When I get a case about discrimination, I have to think about people in my own family who suffered discrimination because of their ethnic background or because of religion or because of gender. And I do take that into account. When I have a case involving someone who's been subjected to discrimination because of disability, I have to think of people who I've known and admire very greatly who've had disabilities, and I've watched them struggle to overcome the barriers that society puts up often just because it doesn't think of what it's doing -- the barriers that it puts up to them. Justice Alito noted that he would allow his personal background and sympathies to influence his decisions. Guess how Senator Sessions voted on the Alito nomination? First he voted aye on a 10-8 party line vote in the Judiciary Committee to move the nomination to the Senate floor, and then aye once again to approve the confirmation. That's two votes for empathy from Senator Sessions. President Obama said that he would nominate judges based on their ability to "empathize" in general and with certain groups in particular. This "empathy" standard is troubling to me. In fact, I'm concerned that judging based on 'empathy" is really just legislating from the bench. The Constitution requires that judges be free from personal politics, feelings and preferences. President Obama's "empathy" standard appears to encourage judges to make use of their personal politics, feelings and preferences. This is contrary to what most of us understand to be the role of the judiciary. Senator Grassley, like his colleague from Alabama, voted aye and aye. What the senators really mean when they say that they don't want empathetic judges, is that judges can be empathetic, but only if it's for a conservative cause. This weekend the Puget Sound Business Journal ran a great article about the growing rift between the state's meanest, nastiest right wing lobby, the Building Industry Association of Washington (BIAW) and its largest local, the Master Builders Association of King and Snohomish Counties, who have been sparring over the former's hardball legislative tactics and fierce allegiance to the Republican Party. The spat become public earlier this year when BIAW went after the local, attacking it in its newsletter for deciding to hire its own lobbyist. More recently, BIAW's board escalated tensions by voting to cut off any local that hires its own lobbyist from BIAW's cash cow: its industrial insurance pool, which actually turns a profit for BIAW by exploiting the state's retrospective ratings program on the backs of its member-builders. (The State Senate passed legislation to end retro abuse earlier this year, but House Speaker Frank Chopp did not bring it to the floor for a vote). Several lawmakers were interviewed for the article, including Republican Dan Roach and two Democrats who are close to the building industry: Representative Larry Springer and Senator Mary Margaret Haugen. There was nothing particularly newsworthy about Springer's quote (he called the rift "counterproductive" - sure, if you're an ally of the BIAW, it's counterproductive) but Haugen brazenly claimed she prefers one side over the other. Sen. Mary Margaret Haugen, D-Camano Island, said she has worked with the Master Builders and found them reasonable. "The Master Builders have far more credibility..." she said. "I won’t let BIAW in my office." Haugen would have us believe, with those seven words, that she's no friend of Tom McCabe and the gang at McCleary Mansion (BIAW's headquarters) but her recent actions indicate that BIAW is in fact welcome in her office. Very welcome. For example, last year, she accepted an eight hundred dollar check from the BIAW's political action committee to her reelection campaign. Haugen happens to be the person responsible for the death of the Homeowner's Bill of Rights this past legislative session. At the BIAW's behest, she assembled a group of Democratic senators who were prepared to join Republicans in favor of a striker amendment (PDF) offered by her and drafted by the BIAW that would have completely and methodically gutted the bill and its protections for homeowners. Sen. Mary Margaret Haugen (D-Camano) deserves a lot of credit for recognizing the negative impact this legislation would have had on the housing industry and honest contractors. For her role in torpedoing the legislation, Seattle Post-Intelligencer columnist Joel Connelly gave Haugen a new title: Belle of the BIAW. But evidently Haugen isn't very proud of her association with the BIAW, and is trying to create the impression that she finds the state's meanest right wing lobby as reprehensible as most of the Legislature's progressive Democrats. That's not going to fly. As the old adage goes, actions speak louder than words. And Haugen's actions have demonstrated that she is only too willing to do the BIAW's bidding. That she is suggesting her relationship with BIAW doesn't exist only makes her betrayal of Democratic values more shameful and disgusting. Back in 2003 in the midst of the historic campaign to recall California Governor Gray Davis, candidate Arnold Schwarzenegger, much like the on-screen characters he plays, was full of bravado and one-liners regarding the perceived failures of Davis and the changes he (Schwarzenegger) intended to make. After taking a close look at California’s budget, it’s hard to make any sense out of it. California’s budget has become a patchwork of special interest give-aways draining precious resources from core programs such as education, public safety and health care. There are also hundreds of millions of dollars-if not billions-of documented waste, fraud and abuse in state spending. Our first order of business is to get California’s operating deficit-estimated at between $5 and $8 billion-under control. I will ensure that California government lives within its means-something working families manage to do everyday-and reins in spending to close the operating deficit. I support a constitutional limit on annual spending increases and an unambiguous constitutional requirement that the state pass a balanced budget, so that California never finds itself in this mess again. I will restructure our inherited debt, estimated at between $12 & $20 billion. Gray Davis was recalled in the October 7, 2003 special election in Calfornia and Schwarzenegger became governor. Fast forward to 2009, where Governor Schwarzenegger has had nearly six years at the helm of California state government. After years of talking about budgeting like families have to and living within means, Governor Schwarzenegger sits staring at a $26.3 billion shortfall. In addition, there is still no constitutional amendment in California to require a balanced budget. And on top of that, Governor Schwarzenegger has become the first governor since 1992 to issue IOUs instead of payments to vendors, taxpayers (California has a state income tax), college students receiving state financial aid (the state has a higher education financial aid program called the Cal Grant) and local governments providing social services. California issues IOUs instead of payments for the first time in nearly two decades. The state currently has a $26.3 billion shortfall. California is ready to issue its first IOUs instead of money since 1992. On top of that, many state workers have been ordered to take an extra furlough day. It's worth noting that in 1992, when the state last issued IOUs, California's governor was Pete Wilson, a Republican. Yes, Governor Schwarzenegger did not create the economic downturn that has plagued his state and our country, but he has failed to deliver what he promised. For all of the talk of fiscal responsibility, Arnold Schwarzenegger's promised economic reforms are much like the characters he plays in movies: a work of fiction. Less than a month after unceremoniously dumping the WaMu brand and finishing the process of stamping out all traces of the former Seattle-based financial giant, Chase has again rankled the Emerald City with its decision to stop sponsoring One Reel's fireworks show on Lake Union, a commitment it inherited when it grabbed WaMu from the FDIC at a ridiculous rock-bottom price last September. Judging from the comment threads attached to the articles that disclosed the news on Seattle area forums, Chase's decision isn't making the bank any friends. And it comes at a particularly odd time, since the financial behemoth is in the midst of a West Coast marketing campaign designed to convince Washingtonians, Oregonians, and Californians not to take their business elsewhere. “Good Morning Chase Bank,…..er..ah…I mean Afternoon to you…. I love that commercial….it kinda spells it all out in terms of our relationship with the rest of the country…..
Chase has no interest in this community. Their abundant advertising that completely misses the mark is proof of that. This is just another example for all those who were still questioning whether they did. All they want is our money. Now is the time to move your money from Chase, if they've left you with any. used to bank with WAMU and it didn't take long to realize Chase is awful. Switched to BECU for much better terms on the account, credit card, line of credit. There is absolutely no reason to stay with Chase. They make absolutely no bones about the fact that all they want is your money but won't do anything to facilitate your business. Personally, I'd like to see them go under. Close your accounts today. I didn't really need another reason to pull my money out of Chase, but this is just another reason on a long list that has convinced me. I've been watching with naive optimism that Chase might be worthy of my business, but this kind of ham-handed move demonstrates that they are nothing but a big company interested only in profit. They've lost my business. I've been a member of Group Health Credit Union for a long time, and while they haven't been my primary bank, they've always been extremely helpful and have offered the best rates on car loans and my recent refi. I'm giving them all my business. Been a WaMu customer for many years and have always been pleased with the service until Chase took over. I'm going to bail on them and switch to BECU. While bailing out of our fireworks show, Chase is also working hard to squeeze more money out of its customers. For example, Chase is just notifying some of its credit card customers that their grace period on new purchases is being reduced from twenty five days to twenty. They are also changing the terms for their best customers, who enjoyed fixed rates in the past, but will now have to put up with variable rates. What's more, customers who aren't using their Chase credit cards at all may find their accounts closed in short order. This is standard practice across the industry, but Chase exemplifies it. Several friends have told me that that Chase has cut off their credit, and an account representative at Chase confirmed to me, (when I asked) that the company does indeed close accounts - sometimes merely as soon as six months after a customer brings their balance down to zero. Chase's behavior should come as no surprise to anyone who knows its history. Formed in 2000 in a merger, JPMorgan Chase is descended primary from three large New York banking conglomerates: The Manhattan Company, formed in 1877 by Aaron Burr (yes, that's the guy who shot Alexander Hamilton in a duel and begged Napoleon to invade America), Chase National Bank, and J.P. Morgan & Co. The latter two companies reached the initial apex of their power during the Gilded Age, a time of extraordinary greed in the United States. (Sound familiar?) Nothing was more important than the pursuit of money, and America suffered for it. The son of a banker, Morgan had not only avoided fighting in the Civil War, but had profited handsomely from it. By the turn of the century, Morgan had his hand in almost every major financial undertaking in America. His banking house was a millionaires' club that loaned money to other banks. Through Morgan, a small group of men were able to take control of the railroads of America, and by 1900 Morgan owned half of America's track mileage. His friends owned much of the rest, enabling them to set the railroad rates across the country. And as for Chase, founded in 1877 by John Thompson and named after Lincoln's Secretary of the Treasury, Salmon P. Chase (with whom it had no connection), it became one of the largest banks in the country during the Gilded Age, and eventually came to be controlled by the Rockefeller family when it merged with the Rockefellers' Equitable Trust Company in 1930. (John D. Rockefeller, as most readers will recall, was the tycoon or robber baron who founded Standard Oil, America's most infamous and hated monopoly). In short, today's JPMorgan Chase, like its ancestors, is just another big, powerful Wall Street bank run by ruthless, greedy men who care only about profit, not people or planet. Many decades have gone by since Morgan, Chase, and Manhattan were founded, but not much has changed, except that the banking industry has become more consolidated and powerful than ever before. That's not good for competition, not good for capitalism, and not good for regular folks. We would all be wise to stop doing business with JPMorgan Chase and instead build relationships with local financial institutions that are invested in the community, especially credit unions (which are member owned). It's the most important way we can put our money to work for the beautiful region we live in. Washington State's Capitol press corps just can't seem to catch a break. After several dizzying rounds of exits by journalist after journalist, two more of the intrepid reporters who cover the statehouse have announced their departures: Adam Wilson of The Olympian and Rich Roesler of the Spokesman-Review. Like many of their colleagues before them, they are both leaving to take government jobs: Wilson as a speechwriter for Governor Chris Gregoire, Roesler as a communications guy for Insurance Commissioner Mike Kreidler. They join a long list of reporters who have jumped ship and taken jobs in government or the private sector. Robert Mak and Alex Fryer, formerly of KING5 and The Seattle Times, now work for Mayor Greg Nickels' press shop. Chris Mulick, formerly of the Tri-City Herald, took a job with the Senate Democratic Caucus in Olympia. David Postman, formerly of The Seattle Times, took a job with Paul Allen's Vulcan. Chris McGann, formerly of the Seattle Post-Intelligencer, accepted a position in the State Treasurer's office. David Ammons, formerly of The Associated Press, now works for Secretary of State Sam Reed as Communications Director. Ralph Thomas, formerly of The Seattle Times, left his job to join Katz Communications Group. Amazingly, all of this has happened within the last eighteen months. It's understandable why the best and brightest are leaving: The writing's on the wall. The traditional media world offers nothing except uncertainty ahead, and it's hard to plan a life around an uncertain future. Being a journalist these days means not having much job security. The good news is that The Olympian and The Spokesman-Review have plans to replace Wilson and Roesler. That's what they've both said. So at least for now, the Capitol Press Corps will be rejuvenated with some new blood, and won't continue to dwindle further. But we're going to miss both Rich and Adam. They did a fine job and the statehouse just won't be the same without them. LIVE from Link: Testing, testing! I'm liveblogging once again from aboard Sound Transit's new Central Link light rail system, for what must be my sixth or seventh opportunity to actually go inside a train. We boarded at Columbia City and have traveled south to Tukwila International Station, which until the end of this year will be the terminus of the line. (The other terminus is at Westlake Center in Seattle). 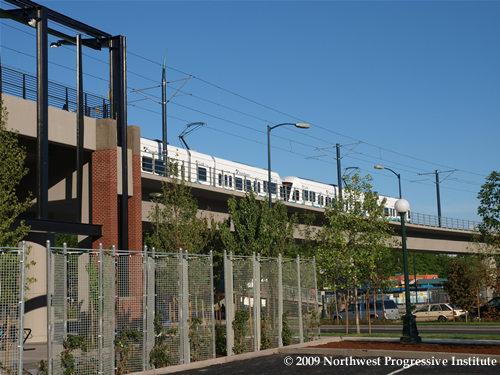 Above: A northbound Link light rail train crosses Edmunds Street at Martin Luther King Jr. Way, just south of the Columbia City Station. This test train is intended to emphasize accessibility and safety. To that end, several bicycles were brought aboard, and Sound Transit board members, including Seattle Mayor Greg Nickels, Councilmember Larry Phillips, and Councilmember Dow Constantine, have each talked about how the system has been designed for easy boarding by people on foot as well as those with wheelchairs or bicycles. 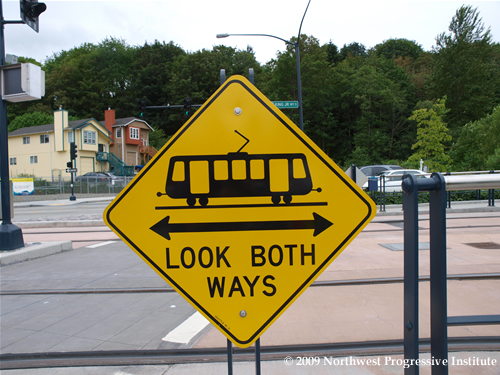 Above: One of the signs reminding pedestrians and bicyclists to look both ways before attempting to cross train tracks. Initially when we came aboard it was a bit stuffy inside, but this problem was quickly addressed by turning on the train's air conditioning system. The trains are well ventilated, so riding should be comfortable on the hottest days (as well as the coldest... the trains also have heating, of course). Aboard the train, to demonstrate how easy it is to ride, were a mother with a small child and stroller, a visually impaired man with a guide dog, and two commuters with bicycles. A gaggle of media were on hand to record the experience, including reporters from most of the major local television and radio stations. 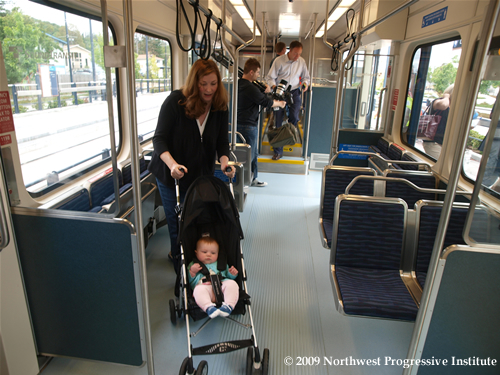 Above: A mother with a child in a stroller prepares to detrain. Some of the plans for the grand opening in a few weeks were also disclosed. The inaugural train going south will carry Seattle Mayor Greg Nickels, and the inaugural train going north with carry Tukwila Mayor Jim Haggerton. They will meet at the Mount Baker Station and get off for a brief ceremony, then reboard and continue in their respective directions to the end of the line before coming back. Above: An ORCA card reader. ORCA stands for One Regional Card for All. It will work on every public transportation system in Puget Sound. Each station will host a Welcome Portal for riders, and all train rides will be free during Opening Weekend. 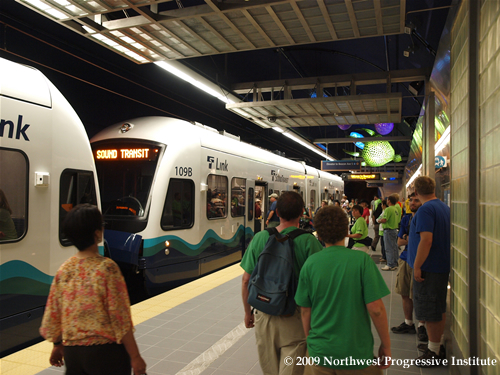 Crowds are expected to be heavy on Saturday, July 18th, so think ahead if you're planning on showing up for one of the biggest events in the history of Seattle-area mass transit. (That means, for instance, taking the bus to get to light rail - Sound Transit Express Routes 545 or 550 are good choices for those coming from the Eastside). UPDATE: I've uploaded a few of the photos I took during and after the train ride. I picked some shots that are unlike what we've published before. Washington's Commissioner of Public Lands, Peter Goldmark, has just announced the release of a letter sent to Glacier Northwest's mining division to halt operations at the behometh's Maury Island mine until questions have been answered about the mine's compliance with the objectives of the Maury Island Aquatic Reserve and the effort to clean up Puget Sound. It is the Washington State Department of Natural Resources’ responsibility to ensure that this lease is carried out in the best interest of Puget Sound and the people of the state. After a thorough review of the lease, I am not confident that NW Aggregate [Glacier] will be able to comply with the lease in a way that is consistent with both the objectives of the aquatic reserve and the clean-up and recovery of Puget Sound. It is not clear how or if NW Aggregate will implement and monitor actions to ensure compliance within the existing lease. I have asked the company to cease operations on the site until these questions are answered. My staff has reviewed the lease, related regulatory permits, and the revised mitigation plan, in the context of the Management Plan. Given this review, I have grave concerns about how your dock and gravel loading operation may affect the health of Puget Sound and the Reserve. The lease requires compliance with the Management Plan which in turn requires the protection, preservation and restoration of the important aquatic ecosystem in the lease area for the entire lease term through performance measures, monitoring, reporting, and adaptive management. NW Aggregate has not submitted sufficient information to demonstrate lease compliance. Please submit all required information prior to July 30, or provide an alternative deadline that you will be able to meet and explain the reasons for delay. DNR requests that no further activities proceed in the lease area until DNR is satisfied that NW Aggregate has complied and can comply with the lease requirements over the full term of the lease. It's a relief that we finally have a Lands Commissioner who is not a rubber stamp for big timber and mining companies, but rather a true guardian and steward of our precious natural resources. Commissioner Goldmark's determination that Glacier Northwest has not provided adequate documentation to ensure compliance with the lease it was previously granted is a very welcome step in a new direction, a direction that respects the concerns of those who believe the expansion of this mine would be harmful to the common good and to our common wealth. What is ultimately needed, however, is legislation that will protect this valuable ecosystem and assure that it will not be further damaged under any circumstances. We at NPI will continue to urge our Legislature to take action to preserve Maury Island... because the well-being of Puget Sound depends upon it. At 11:05 a.m., Sen. Amy Klobuchar was recognized and began the swearing in ceremony on the Senate floor. On defeated Republican Norm Coleman, who conceeded last week after the Minnesota Supreme Court ruling, Klobuchar said: "He did what was right for Minnesota." She points out it has been 246 days since election day. On Franken: "He brings with him that same energy and passion and idealism as our friend Paul Wellstone." Vice President Joe Biden, as is customary, presided over the swearing in. For his photo-op, Franken used a Bible that previously belonged to Paul and Sheila Wellstone, two of the greatest progressive champions in Minnesota's history. (Paul Wellstone served two terms in the United States Senate. First elected in 1990 thanks to a massive grassroots campaign that organized and mobilized young voters, he and Sheila died in a tragic plane crash in 2002. Their legacy lives in today in the form of Wellstone Action). Franken's new committee assignments include Judiciary (that means he'll be voting on Sonia Sotomayor's nomination soon) and Health (where he'll have the chance to be deeply involved in crafting healthcare reform legislation). Franken's fellow Democrats are very excited about his arrival in Washington. When I asked Senator Maria Cantwell about Franken's long-awaited victory last week, her face lit up and she said that she thought Franken would be a big help in getting a good healthcare reform bill through the Senate. Let's hope so. Minnesota's new junior senator certainly has taken office at an opportune time. Is Microsoft Windows to blame for an unnecessarily high amount of e-waste? One of the unpleasant and infrequently discussed side effects of the worldwide information technology revolution is the enormous amount of electronic waste that has been generated by the collective buy it, use it, and junk it mentality that pervades society, especially American society. When personal computers were first invented in the 1970s, not that many people owned one. Today, personal computers are ubiquitous, along with smartphones, music players, and an array of other gadgets which are commonly referred to as peripherals. Computers and peripherals are fragile, complex instruments, and they inevitably either break down after they've been used for a while, or they become considered obsolete... even if they still work just fine. Rapid developments in technology have only bolstered the preexisting notions that serve as the tenets of our throw-away culture. What is considered "state of the art" one day may be seemingly outdated by the next day. Consequently, e-waste has become a big problem - one that states such as Washington have only begun to address with new recycling laws. Such laws have been enacted thanks to the tireless work of many environmental organizations who have been trying to keep computers and peripherals (as well as their toxic parts) out of landfills. One of the reasons computers and peripherals get junked is because people can't get them to work properly. For example, a printer that won't print is no longer useful. And often it's cheaper to go out and buy a new printer than to exert the energy required to get the printer working again. Many of the problems that lead to nonworking peripherals are caused by software. Choice of operating system thus becomes very relevant to this problem, because an operating system that doesn't reliably communicate with peripherals could result in discarded gadgets. Let's go back to the printer example. I have sitting on my desk a nice little HP OfficeJet all-in-one that is several years old. When I bought it, the latest version of Microsoft Windows was Windows XP. To get the HP OfficeJet to print and scan properly, I had to install the included device drivers from the included compact disc. (A driver is a piece of software that allows computer programs to interact with hardware components). Hewlett-Packard's installation wizard took, as I recall, what seemed like the better part of an hour to finish. I had to wait to plug in the USB cable until I was prompted to, which meant I had to sit there and watch the wizard's slow progress until I was needed. After I had successfully installed the drivers, my printer functioned correctly for a few years, until one day, it suddenly stopped working. I was unable to open the HP control panel or do any scanning from my computer. Some investigation revealed that an update to Windows XP had caused HP's badly engineered software (which relied on some outdated Windows components to function) to quit working. On top of that, the printer's scan drivers somehow broke down, so I was unable to do any scanning at all from my computer. I ended up hooking the OfficeJet up to an older desktop computer running Windows 2000, and I managed to figure out how to get Windows to share printers so that I could print to the OfficeJet from my primary machine. I ended up expending quite a bit of time and energy just getting my printer to work again, when I could have just gone out and bought another inexpensive inkjet to take the OfficeJet's place. But I didn't see a reason to replace the OfficeJet since I knew perfectly well that there was nothing wrong with it. I doubt that most people would do the same. When a peripheral refuses to work, the easiest solution for non-techies is typically to go and get a replacement. That's not so big of an issue if a product is new... take it back to the store and get an exchange or a refund. But once the thirty day returns period is past, the warranty is expired, and the company is no longer making the model... there's a temptation to just do away with it altogether. Like many Windows users, my problems with peripherals have not just been limited to printers. At various times, the drivers for my computer dock, keyboard, mouse, and card readers have all malfunctioned, and it has taken extensive troubleshooting to get them working again. I've spent enough time trying to solve driver problems to appreciate how cumbersome Microsoft Windows truly is. Since I began having trouble with my OfficeJet, Microsoft has released Windows Vista and is now readying the release of Windows 7, Vista's successor. HP, however, has not bothered to release a new driver that would make the OfficeJet fully compatible with any version of Windows beyond XP. HP also does not have a driver that would allow my OfficeJet to be hooked up to a machine running Windows Server 2003 or Windows Server 2008. So even if I wanted to make it possible to print centrally to the OfficeJet from a server without "printer sharing", I couldn't. Not using Windows. As a consequence of not being able to print the OfficeJet directly, I had hardly been using it, because having an older desktop on constantly just so a printer can be on standby seemed like a waste of energy. But recently I started using GNU/Linux, or more specifically, the Debian-derived Ubuntu distribution of GNU/Linux. With Linux, adding peripherals - like my trusty OfficeJet - is a breeze. There's no compact discs to insert, no executables to run, no wizards to go through. That's because there are no device drivers to install. They're already present in the distribution. When I plugged in my OfficeJet, it was instantaneously recognized, and that was it. There was nothing more for me to do. I could print or even scan immediately using the printer's full capabilities. The open source drivers are so intelligent they can even display notifications from the OfficeJet (like a low ink warning). For someone used to the trouble of setting up hardware in Windows, this experience was unbelievably cool. Now I no longer chuckle when I see the term plug and play, because with Linux, that phrase really does describe how easy it is. Not all hardware works with Linux, of course, but there are fewer and fewer exceptions these days. The Linux Foundation maintains a database of supported printers, for example, which is pretty big. Chances are, if you've got old peripherals lying around, Linux will be able to recognize them. If everyone used Linux, people would likely hang on to their peripherals longer, because printers and gadgets wouldn't be constantly breaking down due to unreliable proprietary software. That, in turn, would result in less e-waste. The same goes for computers. Upgrading a machine to use the next version of Windows is widely considered to be a pain. It's easier to wipe a hard disk and start over, or, even more commonly, to just buy a new computer which comes with Windows preinstalled. Doing so negates a messy upgrade procedure and the need to buy a CD or DVD in a box. But it also means getting a whole new machine. If everyone used Linux, far fewer people would feel compelled to go out and buy new computers when a new version is released, because upgrading a Linux distribution isn't difficult. The Update Manager reports that there's a new release available, and a few clicks later, the Linux distribution is busy upgrading itself. Not long after, the computer restarts itself and comes back up running the new version. That's all there is to it. The lesson is that great software makes almost any hardware last a lot longer. My OfficeJet is no longer supported by HP, and it won't work properly with Windows. But Linux has given it new life, which means I won't have to replace it for years. And that means less e-waste. What a happy thought. Posted for your reading pleasure on this Fourth of July, 2009, a beautiful document, authored primarily by our third President, Thomas Jefferson, who drew heavily on the thinking of Enlightenment philosophers such as John Locke to persuasively lay out the case for the independence of the United States. But when a long train of abuses and usurpations, pursuing invariably the same Object evinces a design to reduce them under absolute Despotism, it is their right, it is their duty, to throw off such Government, and to provide new Guards for their future security. Such has been the patient sufferance of these Colonies; and such is now the necessity which constrains them to alter their former Systems of Government. Sarah Palin made a surprise announcement Friday that she will resign as governor of Alaska in a few weeks, saying she will try to "affect positive change" from outside government. The former Republican vice presidential candidate hastily called a news conference Friday morning at her home in suburban Wasilla, giving such short notice that only a few reporters actually made it to the announcement. Affecting change outside of government? Gee, you mean like being a Community Organizer? Of course, pundits are going to speculate that Palin is resigning because she wants to run for President in 2012, but that doesn't make any sense. The best jumping off point for the presidency is a governorship. Look at recent American political history - Barack Obama is the first president since JFK to have been elected out of Congress. Why would Palin give that up? MSNBC is reporting that "inside sources" have told them that Palin and her family want to be out of politics for good, and that is a far more plausible explanation for this decision. Palin no longer enjoys the popular support she once had in her home state, and her chances of winning reelection in 2010 were already starting to look dicey. Perhaps she's just tired of being laughed at and made fun of... although she asked for it with her nastiness at the Republican National Convention and on the campaign trail towards President Obama and Vice President Biden. Here's a partial transcript of Palin's remarks at her press conferences. Palin spoke sharply, clearly drawing breath as she finished key sentences. And so... as I thought about this announcement that I wouldn't run for re-election, and what that means for Alaska, I thought about how, well, how much fun some Governors have as lame ducks. They maybe travel around their state, travel to other states, maybe take their overseas international trade missions. So many politicians do that. And, then I thought, that's what wrong. Many just accept that lame duck status. And they hit the road, they draw a paycheck... they kinda milk it... And I'm not gonna to put Alaskans through that. I promised efficiencies and effectiveness. That's not how I'm wired, I'm not wired to operate under the same old politics as usual. I promised that four years ago, and I meant it. It... That's not what is best for Alaska at this time. I am determined to take the right path for Alaska, even though it is unconventional and it's not so comfortable. With this announcement that I'm not seeking reelection, I've determined it's best to transfer the authority of governor to Lieutenant Governor Parnell. And... I am willing to do this, so that this administration, with its positive agenda and its accomplishments, and its successful road to an incredible future for Alaska... so that it can continue without interruption. And with great administrative and legislative success. My choice is to take a stand and affect change, and not just hit our head against the wall, and watch valuable state time and money... millions of your dollars go down the drain in this new political environment. Rather, we know we can affect positive change outside government at this moment in time on another scale and actually make a difference for our priorities, and... so we will. For Alaskans. And for Americans. Let me go back quickly to a comfortable analogy for me, and that's sports. Basketball. And... And I use it because you are naive if you don't see a full court press from the national level, picking away right now. A good point guard, here's what she does: She drives through a full court press, protecting the ball, keeping her head up, because she needs to keep her eye on the basket. And... she knows exactly when to pass the ball, so that the team can win. And that is what I'm doing. Keeping our eye on the ball. That represents sound priorities, remember, they include energy independence, and smaller government, and national security and freedom... and I know when it's time to pass the ball for victory. Either Sarah Palin is leaving the people of Alaska high and dry to pursue her long shot national political ambitions or she simply can't handle the job now that her popularity has dimmed and oil revenues are down. Either way, her decision to abandon her post and the people of Alaska who elected her continues a pattern of bizarre behavior that more than anything else may explain the decision she made today. Palin may very well go down in history as a half term governor and a quitter who, like most bullies, seemed to relish tossing fireballs at her political opposition but couldn't take the heat when fireballs were promptly lobbed back. We couldn't imagine a more deserving fate for Sarah Palin than being consigned to the dustbin of American political history with all of the other divisive and hollow politicians who had their fifteen minutes of fame and then faded away for good. This morning in Olympia, Tim Eyman showed up at the Secretary of State's office in Olympia to submit what he signatures he's managed to collect for his jobs-killing Initiative 1033. Reporters from several newspapers, KOMO TV, and NPR attended Eyman's press event, which mostly featured rehashed Eyman talking points. The Secretary of State's office tells NPI that they received 19,317 petitions, not all of which are full. Eyman claimed to have submitted 314,277 signatures. We'll see if that's how many he really turned in when the Secretary of State finishes processing the petitions. If the petitions on average were all only three fourths full, that would leave Eyman with only 289,755 signatures. Eyman's number works out to between sixteen and seventeen signatures on average per petition. Again, we'll see if it's validated. But the safe assumption is that Eyman has bought his way onto the ballot yet again. A diverse coalition is coming together to fight Initiative 1033. Besides Permanent Defense, many of the state's largest progressive organizations have pledged resources and energy to beat back this terrible idea. The coalition's campaign manager, Aisling Kerins (a veteran of the successful effort against Initiative 933) summed up how the opposition campaign will be waged in a news release: "Educators, health care providers, fire fighters and others aren’t waiting to get involved. We have a story to tell about how crippling this initiative will be to our state and our economy, and we’re starting now." Welcome to the 45th District Democrats, where everybody gets an endorsement! 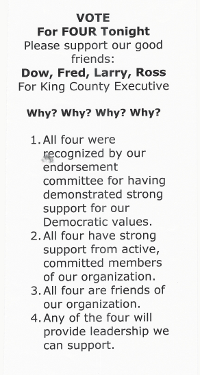 Less than a month after failing to reach agreement on endorsing anybody for King County Executive, the membership of the 45th District Democrats has decided that everybody who wanted our support for the job can have it. That's right, I said everybody. By a vote of twenty two to ten, the membership of the formerly indecisive 45th District Democrats quad-endorsed (is that how you say that?) half of the eight person field for King County Executive: Dow Constantine, Larry Phillips, Ross Hunter, and Fred Jarrett. The motion to quad-endorse was the only motion made and debated for the executive's race at our July meeting this evening. Last month, the LD considered motions to endorse each candidate individually and five motions to endorse some combination of candidates, but all were rejected. So for this meeting, several members of the district - who, for all I know, are apparently fans of that episode of Oprah where everybody got a car - decided to throw their weight behind the idea of endorsing all four. One member even printed up micro-flyers urging fellow members to back a quad-endorsement, which were circulated around the room in addition to all of the candidates' literature. (I've reproduced a copy of this to the left). Conveniently left off the micro-flyer was the LD's own endorsement committee's recommendation from last month that a single candidate, Dow Constantine, be endorsed by the LD organization. I chaired the committee that produced the recommendation, and while I was neither surprised nor dismayed that it was not adopted last month, I was puzzled this month to see so many embrace this motion to cheerily extend our endorsement to every candidate who requested it. I was one of the ten who voted no - because I think endorsements should mean something - and they don't when they're handed out like party favors. Approving a quad-endorsement may be a feel-good way to take action in this race, but it basically amounts to a declaration of no preference. It doesn't help a voter decide who to vote for when they're sitting at the kitchen table looking at the eight names on the ballot. (Most of the voters who would consider our endorsement credible will have already ruled out voting for one of the other four candidates). Nor does it indicate to the public or the press who the district's grassroots base likes the best. But a supermajority of members present and voting decided that's what they wanted to do, so the debate is over. I find it amusing, because three weeks ago we couldn't agree on endorsing anybody, but tonight we couldn't disagree on endorsing everybody. Admittedly, it's true that if we combined the best traits of Dow, Larry, Ross, and Fred, we'd have an incredible county executive, but we simply won't have that choice on our mail in ballots next month.